The Kymijoki River, running from lake Päijänne to the Gulf of Finland, has for centuries attracted the interest of industry. The establishment of nine sawmills in the harbour town of Kotka and the surrounding Kymi district between 1871 and 1876 was an unprecedented event in Finnish industrial history. One of the sawmills was built at the eastern-most estuary of the river, in Sunila. The favourable position of Sunila, at the end of a log-floating route and next to Kotka harbour, made it attractive to industry. The Sunila company was founded in 1928 jointly by five major firms in the wood processing industry. The company bought the sawmill and surrounding land and closed down the old mill. The property was kept in reserve during the recession at the turn of the decade. The mid-thirties saw an economical boom, and this time the most expansive sector was the pulp and paper industry. Thus, in 1936, it was decided to build a sulphate cellulose mill on the island of Pyötinen in Sunila. Matters progressed swiftly, and that same year construction of the road, railroad and bridge connections to the island began. The construction of the workers' residential area began in 1937 and pulp production started in 1938. 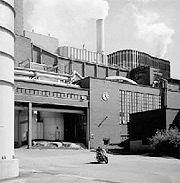 One of the five companies cooperating in the pulp mill project was Ahlström, whose manager, Harry Gullichsen, was a friend of the architect Alvar Aalto. Gullichsen was also chairman of the board of the Sunila Company and thus influential in appointing Aalto as architect. The Aalto-Gullichsen friendship evolved around a common interest in modern ideas about architecture, art, technology and social progress. Lauri Kanto, the technical manager at the nearby Halla pulp mill, was appointed leader of the planning team, with Aulis Kairamo as chief engineer. These four men worked in unison to build an industrial community with state-of-the-art technology, housing and social facilities. The building of the residential area started from the south, with the manager's residence, named Kantola (after Lauri Kanto), the terraced houses for the engineers and foremen and the workers' housing. The first phase was completed in 1937. The second phase took place in 1938-39 and included the construction of the two famous stepped terraced houses named Karhu and Päivölä. Some of the buildings of the original sawmill community were converted for new uses, such as the Pirtti community hall, which is in fact the only one still remaining today, . · As an independent suburban residential area in a city with a declining population, Sunila has not been seen as an attractive alternative in the housing market. · A lack of resources and, in some cases, a lack of interest in the maintenance and development of residential buildings has led to their deterioration. The once model workers' housing became obsolete and real estate values dropped. · A lack of profitable business opportunities has resulted in the neglect of the maintenance of non-residential buildings as well. In one case, activity ceased altogether and the building was left unused. · The once abundant services have disappeared as the number and relative purchasing power of the inhabitants has diminished. Also, the general trend towards mobility and larger housing units has depleted the local service supply. · To some extent, the image of Sunila as a socially introverted factory neighbourhood with an awful lingering smell of pulp continues, although both the fumes and the social isolation are all but extinct. · In 1997 a neighbourhood clubhouse was established, which provides inhabitants with a meeting place, activities and social services. · Pro Sunila, a neighbourhood association founded in 2000, tries, together with other local activity groups, to find a new identity for the area based on its architectural and environmental qualities and its interesting history. · "Elävä Sunila" [Living Sunila], was a development project within the national "Lähiöuudistus 2000" [Suburban renewal 2000] programme (2001-2003), comprised of 15 suburbs situated around Finland. Project activities included social and historical research, promoting Sunila to the general public (e.g. guided tours, media presentations, etc. ), promoting restoration and renovation, placing Sunila in an international context (MOMONECO) and establishing a cooperation network. · Residential buildings have been modernised to present-day standards with regard to basic amenities. · The Sunilan Sisu sports club has started the restoration of the socially and historically important Pirtti community hall. · The long disused Valliniemi sauna and laundry building is back in use, under new ownership, as a hostel and office building. · The memories of old residents are being recorded through interviews and study circles and are being published in book form. The first book "Sunila - kylät piipun varjossa" [Sunila - the villages under the shadow of the chimney] (2004) will be followed by others. The "Sunila lentoon" [Sunila takes off] project 2005-2007 concentrates on questions concerned with the protection, restoration and development of the landscape and the buildings: The town plan of Sunila is being revised to contain more specific regulations for the protection of the architectural heritage. The town plan will be supplemented by detailed guidelines for restoration and development. Inhabitants and property owners participate in the process through discussions and neighbourhood walks. A system for recycling disused building parts is being developed on a regional basis. Pekka Korvenmaa (editor): Alvar Aalto Architect, volume 7, Sunila 1936-54. Published by the Alvar Aalto Foundation and the Alvar Aalto Academy 2004. ISBN 952-5498-04-02. Sirkka Soukka (editor): Alvar Aalto, modernisti, yhdyskuntasuunnittelija, standardisoinnin kehittäjä, seminaari Kotkassa 22-23.5.1997. Published by the City of Kotka. ISBN 952-9826-19-2. Sirkka Soukka (editor): Alvar Aalto Kotkassa [Alvar Aalto in Kotka], näyttely / exhibition 21.5 - 14.9.1997. Published by the City of Kotka. ISBN 952-9826-19-2. Summaries in English. Sunila - kylät piipun varjossa. Published by Pro Sunila 2004. ISBN 952-91-6959-0.